I review a lot of books for my local newspaper. I can’t remember the last one that spoke to me as Provence, 1970 has. Subitled “M.F.K. Fisher, Julia Child, James Beard, and the Reinvention of American Taste,” the book was written by Luke Barr, an editor at Travel + Leisure and Fisher’s nephew. The book hones in on a few weeks toward the end of 1970 when six food luminaries converged in the South of France. In addition to the three writers in the subtitle, Barr writes about Simone Beck, Julia Child’s friend and the co-author of Child’s pioneering volumes on Mastering the Art of French Cooking; Richard Olney, an American writer and artist who wrote meticulously researched books about traditional French country cooking; and Judith Jones, the influential editor who worked with most of the writers involved. Jones is the only major character in the book who is still alive. At 89 she is still cooking and writing and is a former judge at my very own hometown’s charity pudding contest, which will return in 2014. Working from letters, diaries, and memoirs, Barr examines individuals and cultures at a defining moment. Most of his American characters had made their reputations (and built much of their lives) paying tribute to traditional French cuisine. At this point in their lives Child and Fisher in particular were beginning to feel ever so slightly oppressed by the Old World and their old lives in France … and to look forward to a new beginning in the New World. Barr argues that this moment in food history, the time his characters spent together in Provence late in that year, marked a turning point in the way Americans write about food and consequently in the way we cook. Instead of trying to duplicate classic French modes of food preparation, we began to explore our own culinary possibilities. Much of the food culture we now take for granted followed—including our renewed interest in local, fresh food; the status of chefs and food writers (although not this food writer yet, alas) as icons of popular culture; our curiosity about new, varied flavors; and what Barr calls the “moral dimension” of cookery in contemporary America. Provence, 1970 takes the reader on a thought-provoking, delicious tour of a remarkable time, place, and group of people. 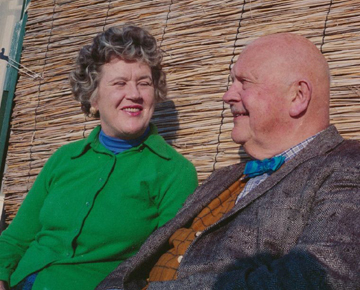 My favorite moment in the book comes when Julia Child and James Beard are improvising a simple supper in the kitchen at la Pitchoune, the small house built by Child and her husband Paul in rural France. For them, as for most of us who love to cook, the preparation of a meal is a balancing act between the knowledge and tradition they have built up over the years in the kitchen and the demands of the unique foodstuffs in front of them. It is an opportunity for creativity and for camaraderie. I treasure Provence, 1970 for scenes like the one in the Childs’ kitchen and also for its implicit message that change can come at any age. All the main characters are middle aged, ranging from Richard Olney at 43 to James Beard at 67. Yet all are preparing for new chapters in their lives and new chapters in books. Above all, I love the book for Barr’s sensitivity to the enduring connections that food can forge between people who care for one another and for the preparation and consumption of meals. His words about his mother near the end of the book speak to the impulse that made me call this blog In Our Grandmothers’ Kitchens. It was my mother, who died a few years ago, who taught me to cook. And when I make something she made for me, or with me, I feel her presence—not in any literal or even ghostly way, but in the form of an atmospheric shift, an emotional warmth. It is striking how cooking binds us to the past, and to the people we love, even when they’re gone. As Christmas approaches, I raise a glass and lift a fork to Luke Barr and to the historical figures he brings to life in his book. 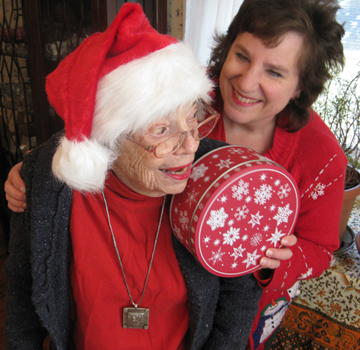 And of course to my own late mother—and to you and those you love, dear readers. This entry was posted on Friday, December 6th, 2013 at 4:00 am	and is filed under Book Reviews, Historical Figures and Events, Products I Like (or Don't Like). You can follow any responses to this entry through the RSS 2.0 feed. You can leave a response, or trackback from your own site. I love MFK fisher, and this book by her grandnephew was ok but not great. 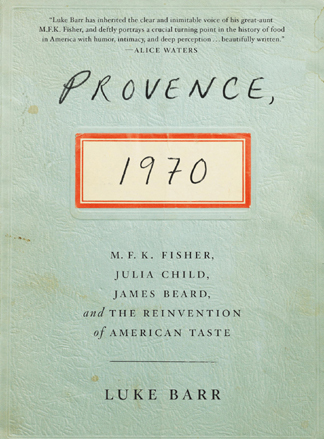 Using interviews with his grandmother – MFK’s sister Norah – and journals, etc he put together the story of 1970 in Provence where James Beard, Julia Child, and many more foodies of he time converged. Now I want to go back and reread all her books. Wish they were available for Kindle! Well, obviously, I liked this book a lot better than you did–but we can at any rate agree about M.F.K. Fisher! Maybe the Kindle thing will happeh. As much as I love to read and cook, I have never read M.F.K. Fisher, although I am always meaning to “someday.” Think I’ll stroll on over to the bookstore this afternoon and see if I can find something. I’d try the library, but cookbooks and books about cooking and eating usually have to end up on my shelves eventually, so why avoid the inevitable. Can you imagine, though, Julia, Beard, Jones, Olney, Fisher and Beck sitting around the table with you…listening to their stories? Wow! I’d even pick up the tab for that one! The good news is that you wouldn’t HAVE to pick up the tab because they would be cooking for you. Happy reading, Grad! Tinky, I’ve read this book; and I agree with you–it’s wonderful. Oh, to have been in that kitchen with Julia and James. Can only imagine. M.F.K. Fisher’s crown was somewhat tarnished, however. She was a bit melancholy, wasn’t she? But, the food, the incredible food they all made. I really like Julia Child even more (if that’s possible) after reading this book. I love going to the Smithsonian and looking through the glass at her kitchen. The Queen of Cookery as far as I’m concerned. Thanks for the great review. I think for some readers melancholy feeds art, Margie; it seems to have done so for Fisher. And OF COURSE I concur about Julia. This is a wonderful book. Thank you for mentioning it! My pleasure! It made me happy to write about it. Knowing of so many of these people it would be fun to have a good gossip with them all. Can’t wait to get hold of the book. Middleaged? I don’t believe it! Bless you. The heart IS young. But the chin (chins?) is beginning to look a little middle aged.